Time to grade the supes in their first year of service. The “new” and “progressive” board you drafted and sent into the fray last year. I’d wait till they’ve actually finished a year, but the holidays are coming up and I’ll be too bombed & toked out to do much. All of them are smarter than the president (of the U.S.A.). None has been convicted of murder. Not one belongs to the Taliban. Naw. That is soooo out of character for me. I’ll stick to the low road. Away we go. Leland Yee has the loyalty of a Taliban warlord without the macho wardrobe. Any challenge to the mayor or da mayor’s contributors gets a “nay” from Yee. Newsom is convinced that he’s going to be the next mayor and wants to keep the powers intact so that he can funnel them to his friends. Watch the boy at the board. He is unbelievably condescending for anyone his age. Aaron Peskin. The sharpest mind on the board. 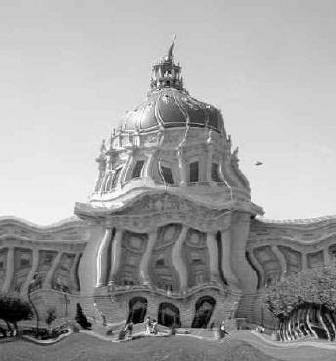 You make a maze for this gang to stumble through & Peskin is there waiting for the others with towels, drinks … and contracts that sell the people short and increase his bargaining power. He & Newsom are the busiest bees making deals and giving favors. Building their own machines. I kinda like that. Plus, Peskin is funny as hell. And he fears nothing. Mark Leno. I’m starting to like this guy. I don’t know why I keep him 5th worst. I actually think he’s breaking free of the onus of having been appointed by da mayor originally. Tha’ other day, he stood up in board and chastised the likes of Gonzalez and Daly for refusing to put Department of Building Inspection under tighter board control. My gut feeling here though is … in a pinch … Leno votes with Willie & Willie’s interests. Prove me wrong. Sophie Maxwell. So much promise. But time it is a-passing and she’s been in the developers’ column too many times. I believe her heart is good. The best thing we could do for Sophie (and most of the supes) is to kick her salary up to $125,000 per annum and let her spend full time on the job. Gerardo Sandoval. My happiest surprise. He must have many opportunities to sell out … but he doesn’t. He has improved immensely. He’s here for his voting record. He does NOT vote with any machine. I like the kid. Chris Daly. He votes the way I like damned near 100% of the time. That’s all any voter could ask for and I am, after all, just an obnoxious voter with a keyboard. Daly has blown me away. I thought he’d have his head turned. Develop a taste for champagne. It hasn’t happened. Jake McGoldrick takes more of my bricks than any other supe because he is a world-class space cadet. He is also an honest “Mister Smith Goes to Washington” kind of guy. He’ll make a great point, argue it until everyone grows cobwebs, then forget what he was talking about. I want him on the board. The runaway egos need this kind of guy sitting at the end of the bar. Tommie Ammiano. I love him dearly. However, I would like to see a mayor not controlled by PG&E & we already lost the city attorney & treasurer to the big boys. What happens (or doesn’t) next year is Matt Gonzalez. Gonzalez works 20% harder than any other supe. He goes to 20% more meetings. He is in control only in Rules Committee (thanks Tom) and any serious City Hall observer will tell you that “Rules” is the best free ticket in town. Ya wanna see Ex-SFUSD Rojas wrestled to the ground? Try Rules Committee. Ya care to see the housing projects freed of gangster management? Check out Rules Committee. If this guy’s not your next mayor, that’s OK too. After all, you get what you deserve.